2-5/16" Bi-Metal Hole Saw. 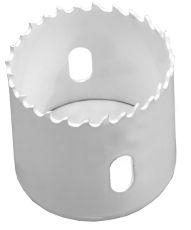 These Bi-Metal Heavy Duty Hole Saws are industrial quality, USA Made, and are sold at wholesale prices. These hole saws are similar to Lenox, Dewalt, and Milwaukee brands. Perfect for use in Stainless Steel, Cast Iron, Mild Steel, Brass, Aluminum, Plastic and Wood these are USA Made.